“Why does the dairy industry push the U.S. Food and Drug Administration so hard to crack down on raw dairy producers? “The deaths of 31 people in Europe from a little-known strain of E. coli have raised alarms worldwide, but we shouldn’t be surprised. Our food often betrays us. Tagged as antibiotics, CDC, E-coli, food, health, industry, Livestock, New York Times, Nicholas Kristof, safety, U.S.
People are getting more sensitive to the ethical dilemmas involved with what can easily be seen as systematic torture of other species for corporate gain. 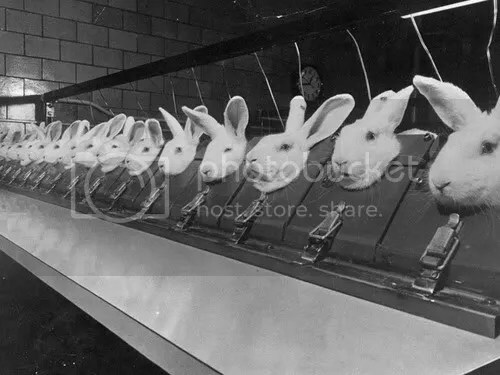 In this picture (from Tumblr) , rabbits are restrained for "scientific" testing of chemical products. Will pictures like this soon be verboten? “A supermarket shopper buying hamburger, eggs or milk has every reason, and every right, to wonder how they were produced. The answer, in industrial agriculture, is “behind closed doors,” and that’s how the industry wants to keep it.